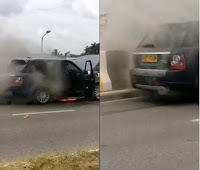 Home / Editor's Choice, Entertainment News, Videos / A Range Rover catches fire and burns into ashes at Changamwe, Mombasa (VIDEO). A Range Rover catches fire and burns into ashes at Changamwe, Mombasa (VIDEO). Friday, August 31, 2018 - This owner of this Range Rover is counting losses after it caught fire and burnt into ashes at Changamwe, Mombasa. Passers-by milled around and watched in shock as huge flames reduced the expensive Range Rover to ashes.